Milkshake by AudioThing is Soundware (e.g. samples or presets that load into other products). 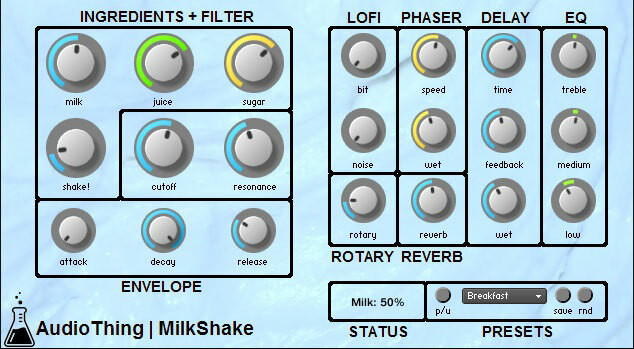 MilkShake is a pad/texture/mallet machine based on Kontakt. The samples of milkshakes were carefully recorded using classic kitchen supplies and a juicy Waldorf microQ virtual analog synth. Milk, Juice and Sugar samples. Bitcrusher, Rotary, Phaser, Reverb, Delay, EQ. 24 User Presets (save function within the Kontakt GUI). Native Instruments Kontakt 4.2.2 full retail version is required.